The end of 2017 provides an opportunity to identify strong and weak points of your current activities as well as determine necessary changes in the strategy of your online store. The increasingly competitive world of e-commerce challenges companies and makes them adjust their marketing strategy to an ever changing market. So how does your online business compare with other businesses in your industry? To help you assess where you stand and make informed decisions about your marketing strategy and budget, we gathered and analyzed data from a wide spectrum of major e-commerce industries to show the sources and types of their website traffic, how they leverage advertising, the usage of the emotions in their ads and the makeup of their backlink profiles. search results and website pages in the correct language or regional URL). We hope you find the insights gleaned from our research helpful in formulating a smart, cost-effective strategy for your e-commerce site going forward, be it a small business or international enterprise. 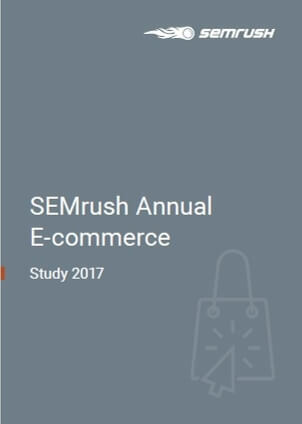 You can also download the report by visiting the SEMRush website.